When your biggest complaint is that fog obscured your view of one of the world's great cities from the start line you know that you have had a pretty special day of cycling. The Campagnolo Grand Fondo New York promised much and delivered. 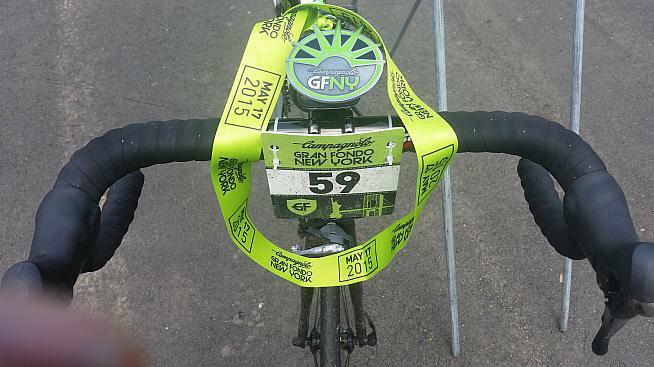 The near flawless logistics matched that of a big city marathon, the course was testing but not brutal, the marshaling very smooth, support - rolling and at the food stops - was top notch and even the required green GFNY jerseys added to the feeling that this was a big event. 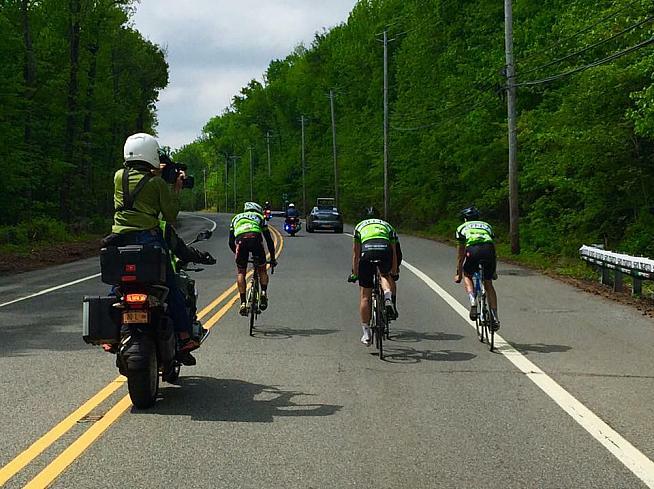 The winner covered course from the George Washington Bridge north to Bear Mountain and back to Fort Lee in just under four and a quarter hours averaging 23.5 mph. My pace over the 100-miles and 8,000 feet of climbing was a little more sedate. I was pretty pleased to finish in an offical time of 06:15:40 for 681st of 2,585 recorded finishers for the full distance at an average speed a hair's breadth under 16 mph. The goal had been six hours, but a puncture, a badly timed halt to reattach my saddle bag and two other unplanned stops were probably the difference between what I clocked and being very close to a 5-handle on my time. The weather certainly helped. The overnight rain had cleared by dawn and it was so mild that I successfully gambled on leaving all jackets, arm warmers and other insulated items in the car despite the warnings that the bridge would be a frigid wind tunnel. Not this year, hence the lingering fog. It was humid though while the clouds lasted and the roads were still wet. For a good portion of the day drafting meant accepting a fair amount of spray and crud from the rider in front. 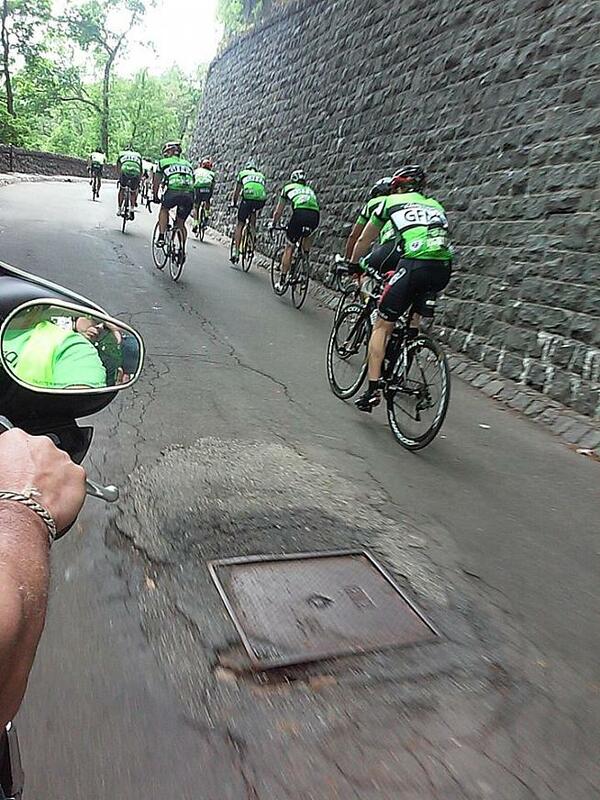 On the descent into Piermont there was another consequence for one unlucky rider. On the sharp left curve before the right turn onto Piermont Avenue I heard the dreaded sound of carbon fiber, metal and flesh hitting the road behind me. By the time I had applied the brakes, unclipped and turned around the guy was on his feet and dragging his bike to the side seemingly not badly hurt. Later, on Colle Andrea Pinarello, I saw another rider with a plate-sized bloody patch of thigh/buttock, but, thankfully, I did not witness any serious crashes. It was only during the Pinarello/Cheesecote section that the sun broke through properly. By then Bear Mountain (4 miles, average 5.1%, max 10%) was in the books - reckon I passed more than I was passed by - I'd made my first food stop at the top and I'd even used my mass to overtake a few on the way down. At this point, the 600 who had opted for the shorter route were done for the day. The 25 miles or so parallel to the Hudson from Piermont to Bear had gone smoothly and quickly with wheels to hold on to and decent groups developing bar a deflating moment. On the northern edge of Stony Point 33 miles in I felt the depressing wobble of a leaking rear tire. A few expletives later my mood improved significantly as one of the support scooters stopped, gave me a tube and inflated my tire with his hand-held electric pump. Nine minutes after stopping I was on my way again with my C02 and spare tube still in reserve. I had always thought that miles 53 to 65 over the hills inland from the Hudson were going to be the real challenge. The initial rise from the river is steep and Andrea Pinarello (2 miles, 4.9% av, 12% max) and Cheescote (1 mile, 4.6% av, 18% max) follow in quick succession. Again, and to my surprise, I was passing people as I span up them and seemed to get the under-/overcooking balance about right. It was a good feeling making my second and final food stop at Pomona with the main climbs behind me. I felt strong and seemed to be overtaking people at will in the miles after the aid station. Bad luck struck again when I had to stop to reattach my saddle bag having found that elusive strong group. To add insult to injury, I spent the next six or seven miles following them imagining how much easier the going would have been drafting just 400 yards up the road before they disappeared from sight. Masochism is a sizable part of the identity of cycling - think "Shut up legs! ", a certain high-end brand with "ph" in its name and "it doesn't get easier, you just get faster" for just a few examples. Sometimes, however, cycling is just cruel and there is nothing more agonizing than being so close to the protection of a group and a wheel to follow, but an unbridgeable gap away. I doubt Camila Cortes Severino and Oscar Tovar suffered in the same fashion. They both completed great doubles by taking the top step on the GFNY podium for Colombia to add to their wins at the GFNY World CRM GFNY Colombia race in late April. Tovar took the NY men's race in 04:14:24. He was followed home by compatriot Raul Alexander Monta in 04:15:27 with Timo Kreiger of Switzerland in third just three seconds behind, Michael Margarite of NYC fourth in 04:15:47 and Gavreil Epstein from Englewood, NJ, fifth in 04:29:06. Cortes of Bogota, who also won in NY in 2013, beat the women's field by 20 minutes, finishing in 04:38:40. Andrea Myers from Danbury, CT, crossed the line in second clocking 04:58:46, Yamile Lugo, also of Bogota, came third in 05:06:28 ahead of Paolina Allan of Aurora, Canada, in 05:11:39 with Jamie Nicholson of NYC fifth nine seconds behind Allan. Subsequently, Tovar and Lugo were revealed as dopers by US Anti Doping Agency (USADA) testing and disqualified. 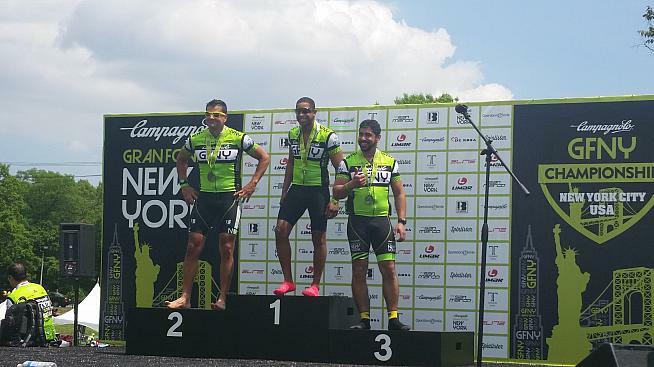 The cosmopolitan Top 5s reflected the number of foreigners in the GFNY field. One in three riders was non-American from 70 nations in all. Throughout the event I caught fragments of Spanish, German, French and a few unidentified languages. What was universal - when I understood it - was praise for the organizers and this has followed through on social media in the aftermath. Leaving aside my personal parking problems, reaching the starting corrals with the polyglot crowd was much easier than I had dared hope. A very pleasant surprise given the thousands of riders involved. At a couple of points, the first of which was the bottom of the ramp up to the bridge, numbers and wristbands were checked, but it was always a question of dismounting and walking, not stopping. On the inside of the spiraling ramp there was a Porta-potty shanty town with racks for bikes as over-hydrated bladders were drained. Normally the Achilles heel of mass-participation events, the scale of the facilities here meant the wait was not long. On the bridge the pens - highest numbers nearest Manhattan - filled most of the width of the outbound lane with access to the further forward corrals down the righthand side. Bar a lone idiot I saw trying to squeeze his way through non-existent gaps, the crowd was good-humored and accommodating in that way that happens when you are all on the same bridge together. With the formalities out of the way, the race was off bang on seven o'clock and my second surprise of the day was not far away. I had researched the route, ridden the far end of it solo and done one of the complimentary group training rides with Gruppo Sportivo GFNY from Strictly Bicycles in Fort Lee, the site of the new finish. That ride had set off north on 9W and returned the same way and I had blithely assumed we would cover the same asphalt on race day. Coming off the bridge in New Jersey a series of turns and bends pointed us South (what!) and then East and down and along the Palisades - idiot boy, never assume. It is a lovely road, especially with no traffic, but a heck of a lot more up and down than staying on top of the bluff. Alpine, the first climb of the day took the fluorescent green river of riders back up to the top and on to 9W for the first time. And, of course, we would be coming back the same way - got it. Right, the profile maps made sense now. I had not been on the bike for over a week to rest a troublesome calf and it was a great relief to spin up Alpine without a reaction. 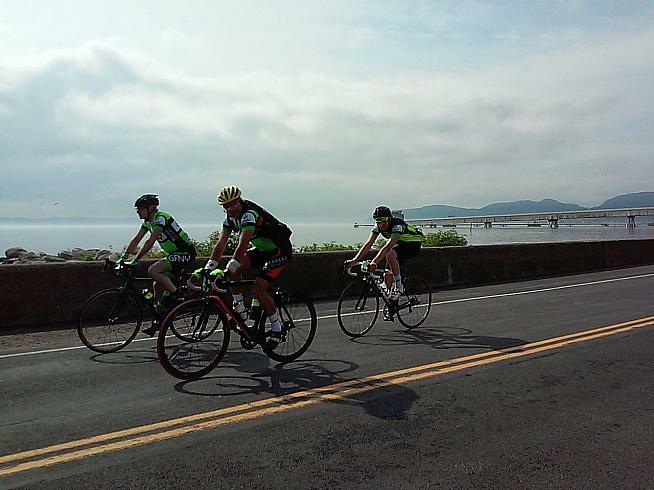 On 9W I managed to grab the back wheel of a sizable group and we ate up the miles before the drop down to Piermont. It was on 9W on the return leg that I made my last unplanned stop. The usual courtesy cry to a dismounted rider of "Are you alright?" with its implication (not always genuine) that you are happy to stop to help, was met by an appeal for assistance to get a back wheel back on post-puncture. A couple of minutes later, with oily fingers and some karma points banked I was back under way. It was then just a question of dropping back down the Palisades, which is a top descent, before the last climb back up to the top and a flattish mile or so to the finish and the superb festivities laid on. Just to squeeze the very most out of the day, before the line I managed to pack in my first twinge of cramp and a sprint finish to see off a silver-haired veteran. Nothing more tempting than an empty podium.